That’s not a very buff Mies, that’s the other “Mastermind of the German People” Johann Wolfgang von Goethe. (Did he have über-abs like that?) 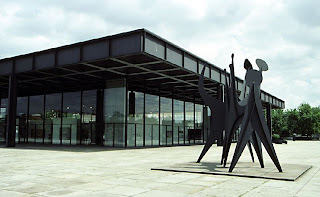 Goethe is seen in an extra-fine post by Lynn Becker, seeing Mies’ buildings as sculptural backdrops. 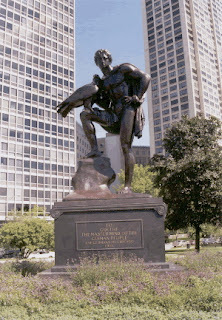 SuperGoethe, cape and all, stands by Mies’ Commonwealth Plaza, 330-340 Diversey Avenue in Chicago. I think they should replace it with a statue of Mies himself, his cigar pointing towards his building. 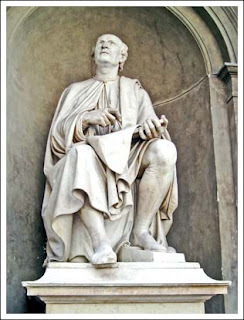 As Florence, Italy has a statue of Brunelleschi looking up at his great dome. 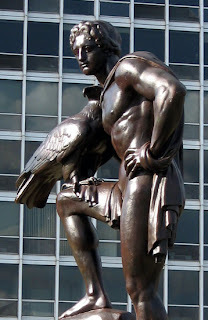 My friend Tim Samuelson suggested we just replace Goethe’s falcon with a martini and call it a day. Busts of Mies überwache (watch over) the entrances to the (former) IBM building and Crown Hall. The one in Crown Hall is by Hugo Weber, the one in IBM is by Marino Marini. Then there’s this bust (not of Mies, though it almost could be, put a cigar in the bottom photo.) It’s from Easter Island and in 1968 it stood temporarily in front of the Seagram building, on a pedestal by Philip Johnson. Read why: “In 1968, when, quite unbelievably, Lan Chile airlines and Air France were planning to bulldoze part of Easter Island (perhaps one of the finest sites of ancient indigenous sculpture) to create a mid-Pacific refueling station for transoceanic airplanes, (the creator of the Landmarks Foundation Protecting Ancient Sacred Sites Globally, Samuel Adams Green) and actress Yvette Mimieux, among others, hurriedly traveled there. Green had been contacted by retired U.S. Army colonel James Gray, the high-minded founder of the International Fund for Monuments, who asked Green to help bring attention to the impending archaeological and anthropological disaster. In the early 70’s a many-tonned Olmec head from what is now Mexico stood for a while on Seagram Plaza. (And one in Houston by his museum there, if I remember right.) 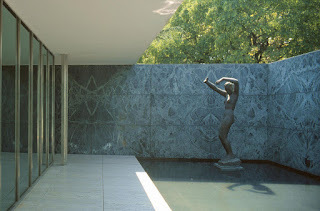 Lord Palumbo used to have outdoor sculptures on the grounds of the Farnsworth House, and Bertoia rods on the porch, but I never thought that worked. The house is too pure. 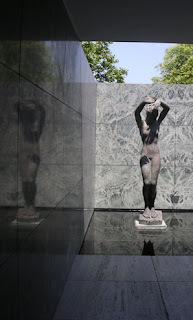 The same reason, I’d say that Mies didn’t put sculptures in the waterpools at Seagram (though he thought about it.) I’ve seen Bertoias in units in 860-880 Lake Shore Drive and they look great. I don’t think it works. It’s not needed, doesn’t add anything and throws off the symmetry. (The contrast to the New National Gallery is Scharoun’s Philharmonic Hall nearby, with anything but a flat roof, and in golden-yellow metal.) 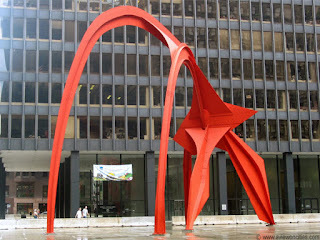 In Chicago’s Federal Center the Calder works well, it adds color, curves and contrast. Come to think of it, it’d be nice to see what the plaza would look like without it! When they remove all the potted plants from a Mies lobby (for restoration work) the lobbies look better. Again, more pure. The light and the volume is the sculpture. No further ornament is needed. 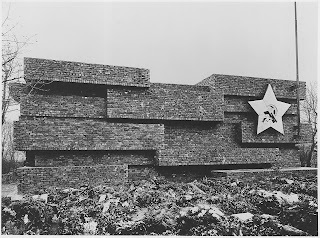 They talk about rebuilding it in Berlin. Thanks for the inspiration Lynn! You are currently browsing the archives for the Luxemburg category.